The Glenn L. Martin Company produced the first successful twin-engined aeroplane of American design, as the W. F. Night Bomber or "Seven Ton" bomber (first flown on 15 April 1918). As it is generally accepted that the first bomber built for the USAAS was the MB-1, the view can be taken that the W.F. and MB-1 are one and the same. The MB-1 bomber first flown 17 August 1918. Contemporary reports state that the W.F. was converted into the passenger and cargo-carrying Commercial type. 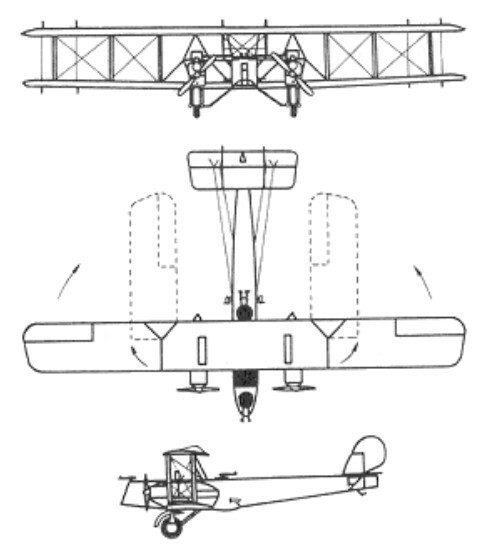 Again it is known that one of the ten MB-1 was so converted, although a drawing of the Commercial made in 1921 shows a rounded-nose aircraft with folding outer-wing sections, single-wheel landing-gear units and open cockpit for the pilots, while the MB-1-type Commercial was actually produced with an enclosed cockpit. Nevertheless as features of the Commercial were subsequently to be found on the improved MB-2 bombers, including the revised single- instead of double-wheel landing gear units, it can be taken that the W.F. Commercial and MB-1-type Commercial or T-1 were the same aircraft. All but one of the remaining MB-1 were produced as bombers or observation aircraft, followed by four more military MB-1 for US Government air mail services. A further two were produced as torpedo bombers for the US Navy, which designated them MTB-1. As an interim stage between the MB-1 and the later MB-2, Martin produced the MT-1 extended-wing torpedo bomber, eight of which were operated by the US Marine Corps. The MB-2 itself was powered by 313kW instead of 298kW Liberty engines and had the wing span of the MT-1 and the landing gear of the Commercial. The NBS-1 was a wood-and-canvas biplane without staggered wings, employing twin rudders on a twin vertical tail. The first 20 (five MB-2 and 15 NBS-1) were ordered from the Martin Company by the USAAS in June of 1920. In the MB-1, the Liberty engines were suspended between the wings by a system of struts, but on the MB-2, the twin Liberty engines were lowered to sit inside nacelles attached to the lower wing. As compared to the MB-1, the landing gear was simplified to only two wheels. The non-staggered wings were hinged at the rear spars just outboard of the engines, and could be folded aft for storage. The armament consisted of five Lewis 0.50-in machine guns, two in the front cockpit, two in the rear, and one aimed downwards and to the rear. Bombs were carried in racks in a compartment in the fuselage, or, in the case of large bombs, on special racks or chocks directly under the fuselage. A crew of four could be carried. The NBS-1 also had a unique folding-wings system, hinged outside the engine nacelles to fold backwards for storage in small hangars. The first flight of the MB-2 (serial number AS 64195) took place on September 3, 1920. The MB-2 was designed specifically as a night bomber, and sacrificed the high speed and maneuverability of the MB-1 for a greater bombload. Ten MB-2s were built by the Glenn L. Martin company in Cleveland, and were redesignated NBS-1 when the new Army designation scheme was introduced. Their serials were 64195/64214. These planes are best remembered today as being the aircraft which participated in the famous Billy Mitchell demonstration of aerial bombardment. 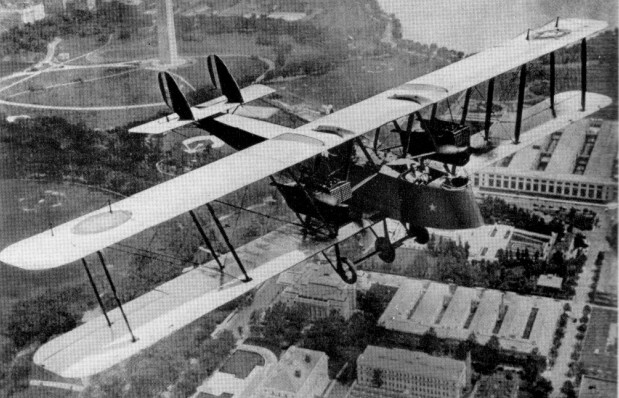 The NBS-1 was the primary bomber used by Brigadier General Billy Mitchell during Project B, the demonstration bombing of naval ships in July 1921. Six NBS-1 bombers, led by Captain Walter Lawson of the 96th Squadron operating out of Langley Field, bombed and sank the captured German battleship SMS Ostfriesland on 21 July 1921, using specially-developed 2,000 lb (907 kg) demolition bombs externally mounted beneath the fuselage. Other MB bombers and flying-boats destroyed a submarine, cruiser and destroyer. Martin proposed to the Army that 50 more NBS-1 bombers be built. However, under the prevailing policy of the time, the rights to the NBS-1 design were owned by the Army rather than by Martin. Consequently, the Army had the right to ask for competitive bids on the project from other manufacturers. In 1921, Curtiss underbid the Glenn L. Martin Co. for the production of 50 examples of the NBS-1. One XNBS-1 was built in 1921 with two 400hp Liberty 12 engines. In order to spread scarce military procurements among as many manufacturers as possible, contracts for 35 other NBS-1s were granted to the L.W.F. (Lowe, Willard, and Fowler) Engineering Company of College Point, New York and a contract for 25 more was granted to the Aeromarine Plane and Motor Co. of Keyport, New Jersey, in 1921. The 50 NBS-1 built by Curtiss (AS68478 to 68527) were powered by two 400hp Liberty 12 engines. The last 20 Curtiss-built NBS-1 bombers were equipped with General Electric turbosuperchargers. These were the first airplanes to use turbosuperchargers in production quantities. With these turbosuperchargers, the NBS-1 could reach a service ceiling of 25,341 feet. However, the use of turbosuperchargers in bombers proved to be premature, the early superchargers being notoriously unreliable. Curtiss built two XNBS-4 (Model 36: AS68571/68572) in 1924, powered by two 435hp Liberty 12A. These evolved into the B-2. One MB-2, fitted with super-chargers, attained an altitude of about 8,077m while carrying a pilot and three observers. A contemporary report states that, had it not been for the extreme cold and lack of fuel, a still greater altitude could have been reached. The NBS-1 were built with a unit cost of US$23,485 (1920). The first two Martin MB-2s, Air Service s/n AS64195 and AS64196, were retained at McCook Field in Dayton, Ohio, for R&D flight testing, marked with project numbers P162 and P227 respectively, as was the second NBS-1 (AS64201), marked as P222. Four Curtiss NBS-1s were also assigned to McCook. Eight Army bombing squadrons used the NBS-1--the 11th, 20th, 49th and 96th Squadrons with the 2nd Bomb Group based at Langley Field in Virginia, the 23rd and 72nd Squadrons with the 5th Composite Group in Hawaii, and the 28th Squadron with the 4th Composite Group in the Philippines. They remained in service until replaced by Keystone bombers in 1928-29. The Martin MP was a 1919-20 version of the bomber built for the Post Office Dept. Only six were built.